Madrid, an alive and beguiling city, exciting and passionate. A city of artists, beloved of Goya, Velázquez, Picasso, Dalí and Miró whose work adorns the magnificent walls of the Museo del Prado, Centro de Arte Reina Sofía and Museo Thyssen-Bornemisza. 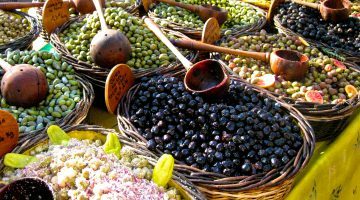 With probably more bars than any other city in the world, an evening in Madrid is full of sparkle and pidazz; from tapas to fine dining, eating in Madrid is a gastronomic delight but don’t expect to eat early, reservations start at 9pm! Where people know how to live! Six hours to explore Spain’s beautiful capital city, it was lunch time so had to grab a sandwich from one of the delicious street delis. Situated right in the heart of the city, on the Calle Arenal, the beautiful Church of San Ginés was built in the Mudéjar style originally in the ninth century. It is one of oldest churches in Madrid. It was rebuilt in 1645. Madrid architecture in The Plaza de Oriente, a plaza and gardens between the Teatro Real and the eastern facade of The Palacio Real de Madrid, the Spanish Royal Palace. 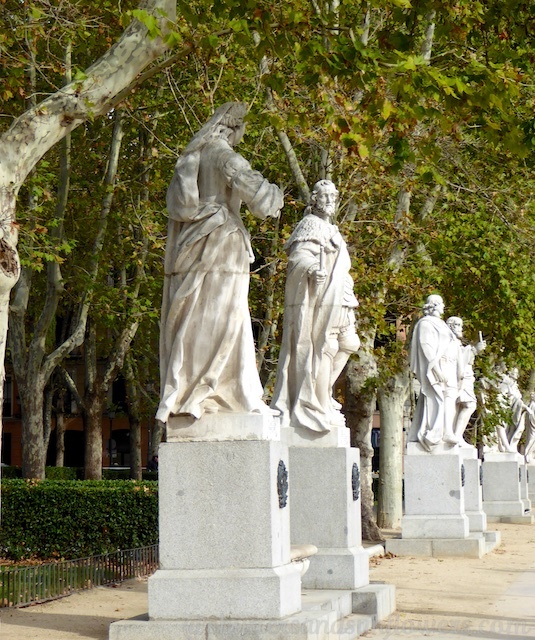 Dominating these gardens is the statue of María Isabel Luisa de Borbón, the Spanish queen regnant (1833-1868). 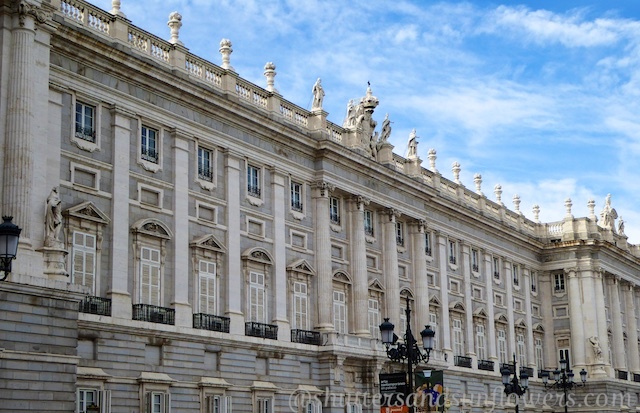 The Palacio Real de Madrid, the Spanish Royal Palace, from the Plaza de Oriente.The Royal Palace stands on the site of a medieval fortress, the Alcazar of Madrid and was transformed into a lavish palace by John II, Charles V and Phillip II who in 1561 made it the official residence of the Spanish Monarchy. It was destroyed in a fire on Christmas Eve 1734. A new Royal Palace was built on this site and completed in 1759. The entire building, built on multiple floors, is made of a series of domes built without a single piece of wood. 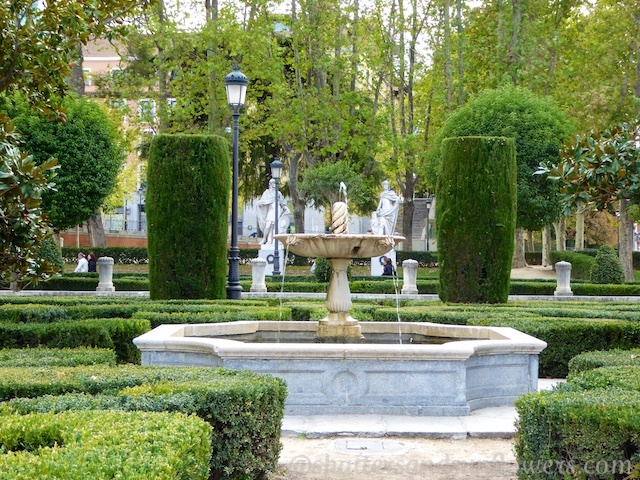 It was occupied by the Spanish royal family until 1931. 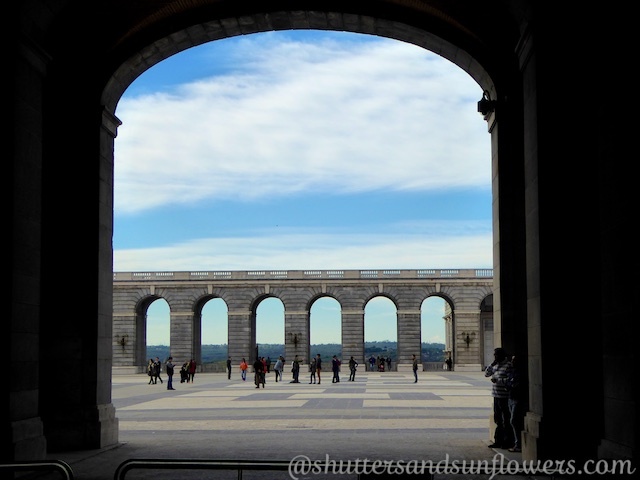 A view into the courtyard of the Palacio Real de Madrid. The main entrance of the Palacio Real de Madrid. The Palace is no longer used as a residence for the royal family but state occasions are still held here. The cathedral is directly opposite the Palacio Real de Madrid. Building started on this cathedral in 1883 as a result of Queen Isabel II signing a Concordat with Rome. Don Francisco de Cubas started the project but it was not completed until nearly a hundred years later. 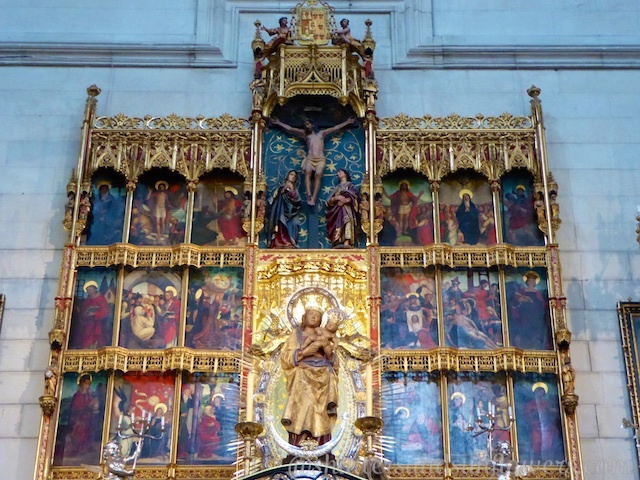 It was consecrated by Saint John Paul II on June 15th 1993. The entrance doors to la Catedral de Sta María la Real de la Almudena. Inside La Catedral de Sta María la Real de la Almudena. One of the ceilings in La Catedral de Sta María la Real de la Almudena. The 16th century image of the Almudena Virgin, the patroness of Madrid, created by Diego Copin of Toledo. 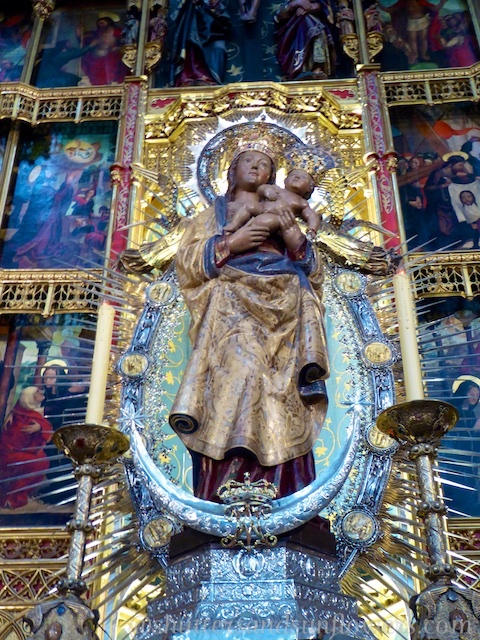 The history of Saint Mary of the Almudena dates back to 1085 when King AlfonsVI found an image of the Virgin Mary inside the city wall of Madrid. He named it Almudena ( from the Arabic word ‘almudaina’ that means city wall). Deemed to be the most ancient devotion, she became the patroness of Madrid. 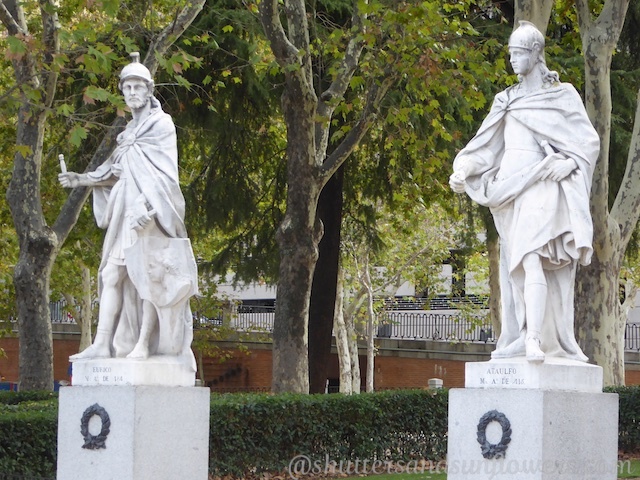 The Statues in Plaza de Oriente gardens opposite Palacio Real de Madrid. 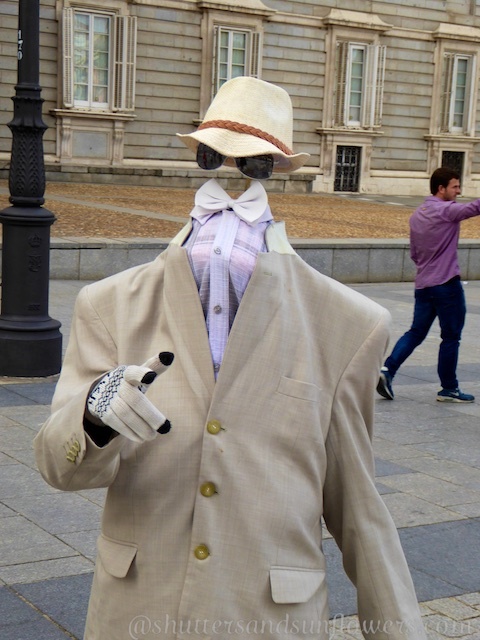 One of the many street artists outside the royal palace, I think he lost his head! There was much I didn’t have time to see, so many more buildings and sites to explore, next time….